The Eel Question is a delightfully dark short story from the prolific Nicola Davies. 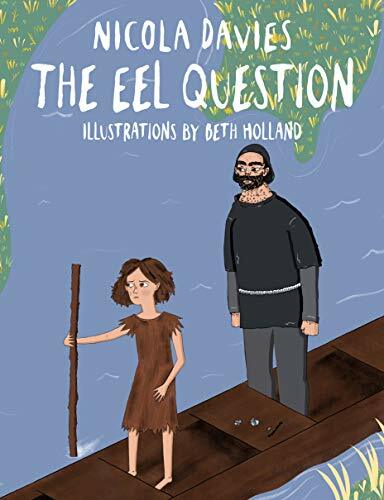 It tells the story of Nant, a young girl, and Dith, her cruel and violent master, who work alongside each other capturing eels on the marshland near their village. One morning Nant discovers a baby otter that has been caught in an eel trap and rescues it from certain death. She works hard to raise the cub away from Dith’s prying eyes and explosive temper but her behaviour soon raises suspicion among the villagers, who decide that they must take action. Can Dith escape her fate and find the freedom that has eluded her for so long? I was drawn into this unusual book almost immediately. The harshness of Dith’s life, aligned with her determination to survive, ensures that readers empathise with her from the beginning. The story has a mythical quality and genuinely feels as if it could have been passed down through the ages. I was particularly struck by the way that it takes a fresh look at the relationship between humans and the natural world. Nicola’s use of language (…the only comment that the marsh ever made was an eternal shushing…) is as powerful as ever, and increases the sense of foreboding that develops as the story moves rapidly towards its slightly shocking conclusion. Beth Holland’s illustrations give a clear sense of Dith’s confusion and panic as events escalate out of her control. The target age for The Eel Question is 7-9 years but it will be enjoyed by children across Key Stage 2. Although short, at only 32 pages, it provides several opportunities for discussion about the way that both humans and animals are treated, and could perhaps be read alongside the excellent Think of an Eel by Karen Wallace.